Last of the Fatties. Two days in Penang. So it’s been a couple of weeks, but I’m back. New domain, new look, new blogging engine. But not much else has changed. Thanks to those of you who noticed I had taken a break, and those who encouraged me to get back to blogging sooner. It’s heart-warming/ego-stroking to know that people actually read what I write! Anyway, enough with the pleasantries, it’s time to clear the decks for new eating adventures. So what was probably going to be another four or five posts is now the #fatty Penang megapost. I was in Penang for a total of four days. This post represents the food I ate in the last two days. You’re about to see why I hit ‘food fatigue’ at the end of this holiday. Let’s start with Penang-style yum cha. 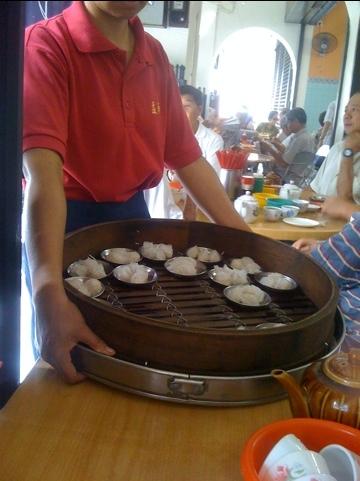 Instead of trolleys being pushed around, dishes are paraded around the tea house by waitresses with huge steamer trays. The servings tend to be typically smaller. To be honest, I wasn’t really that impressed with this, compared to yum cha in Hong Kong, but it was an interesting take on it, and I liked the relatively informal feel to it all. There were all sorts of dumplings and yong tofu-style items. 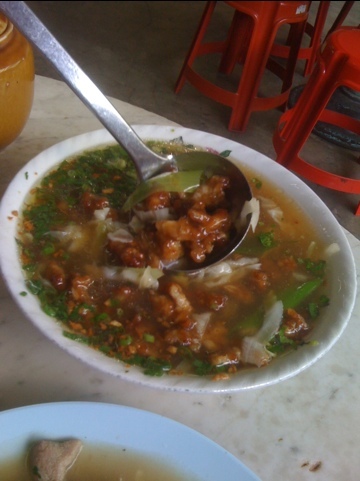 And also the typical braised items, involving bean curd skin, prawn mince, or various types of offal. 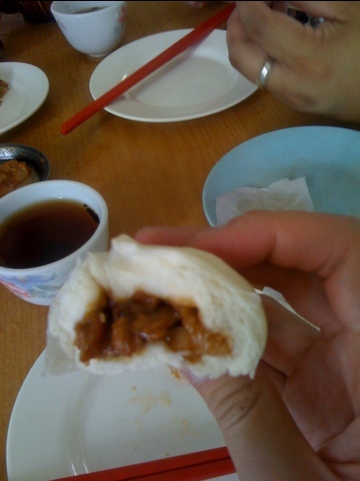 It might seem greedy that we had so many har gao between two of us, but these things are tiny! Which makes them all the more impressive for the pleating skills involved, but they lacked the succulent plumpness of the more famous Hong Kong style ones. So this morning yum cha session took place at around 10am. We then drove around a bit – there’s not much walking to be done when Mr A is your culinary guide – and before too long, it was around 1pm – time for lunch! Never mind that usually, if I have yum cha in the morning, I don’t need to eat until dinner. Mr A took me to a little neighbourhood restaurant, so I could try some typical Hokkien food. First up was an oyster omelette. Having just had one a week ago in Hong Kong, expectations were high. And while it’s not really fair to judge one against the other – as they’re completely different styles – I much prefer the crispy Hong Kong version. This Hokkien version was pretty gelatinous. The omelette is held together by the egg, but there’s also a fair amount of a tapioca or corn starch-based batter involved. To keep this from sticking to the wok, it seemed like they simply fried it up in more oil, which meant it ended up quite greasy and heavy. Also, I wasn’t a huge fan of the strangely sweet chilli sauce. This was some sort of bee hoon dish, I think. Bean thread (the transparent type of vermicelli) ans choy sum stir-fried with prawns, some sort of soy, and a hefty whack of garlic. This dish was great, but a little challenging in the searing middle-of-the-day heat. Mr A said this was a traditional Hokkien Mee. Which was interesting, because I’d always though Hokkien Mee was more of a dry, stir-fried noodle, like Mee Goreng. To be honest, I rarely ever order it, because the size and texture of the noodle itself isn’t one of my favourites, and wherever Hokkien Mee’s on the menu, most often so it char kway teow or laksa. I wasn’t a huge fan of this dish, but I did like the little oysters peppered throughout it. 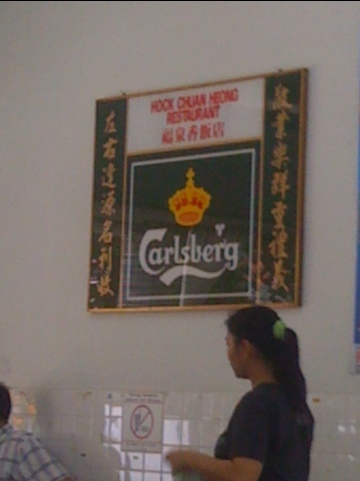 Apparently oysters are a pretty common ingredient in lots of Hokkien dishes. This was another gelatinous Hokkien specialty. 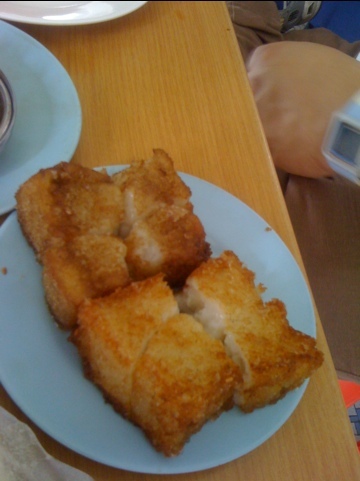 Little chunks of pork had been battered and fried, then cooked in thr broth. 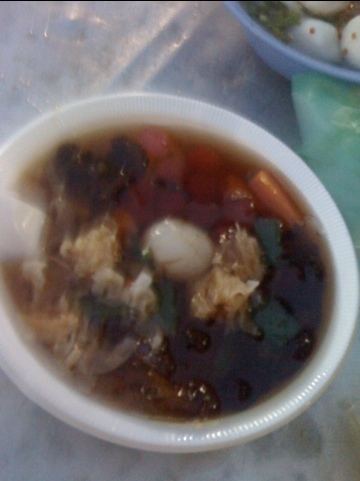 The broth itself had an odd amount of cornstarch in it, giving it a slight viscosity, but not so much as you would find in some Chinese soups, usually involving feathered egg. The end result was a little unpleasant, texturally, though the flavour was not bad. A few hours off – I went for a browse around the air-conditioned malls – and Mr A picked me up again, this time to take me to the local night market near his apartment building. The markets are on once a week, and situated outside the local wet markets. It was similar to Viet Nam in that respect, where the day/night raw/cooked use of market spaces is also very common. We wandered around, picking up various items at different food carts, and then settled down at a table to feast on the goodies we’d collected. It was not unlike visiting a hawker centre, only you could also pick up some cheap sandals, a new mobile phone cover, or some LED torches while you’re there. This was a type of pancake/waffle/crumpet, which had sesame seeds and brown sugar sandwiched in the centre. It should have been dessert, but we came across it first, so ate it was we wandered around buying other items. One reason why Asia is the best continent on Earth: food on sticks. Everywhere. These are some loh bak sausage-y things (it’s spiced pork mince wrapped in bean curd skins) deep frying. Of course we were going to have some of these! Mr A knows the local fish ball guy. And trust me, once you’ve had fresh fish balls, anything you can buy in an Asian grocer pales into insignificance. The genuine article is light, springy and delicate, and is at once wonderfully fish-flavoured, without being ‘fishy’. And no, I have ABSOLUTELY NO IDEA what sort of fish was in these. Nor do I care. They’re that good. A little chai tow kway, anyone? It’s a glutinous rice flour cake (like the lor baak gao, but without the daikon) that’s been stir-fried with beanshoots, egg and soy, similar to char kway teow. It’s pretty great, but again – there’s a pattern here – not advised for those with limited stomach space. Those little vermicelli nets were actually sweets. Like little coconutty hoppers. As if that weren’t enough, Mr A insisted that I needed to try some of the Malaysian version of chin po leung/sam bo luong. It’s a sweet soup with all manner of fruits, grains and fungus in it. Sounds more scary than it actually is. It’s actually very refreshing! The next morning, we went around the corner from the hotel where I was staying, because I was staying in close proximity to Georgetown’s best har mee. This har mee is so renowned that it’s not uncommon to have to wait 20-30 minutes for it. So we ordered, and in the mean time, we ordered other things. ‘Cos you gotta have waiting food, right? Right. Like these prawn fritters. 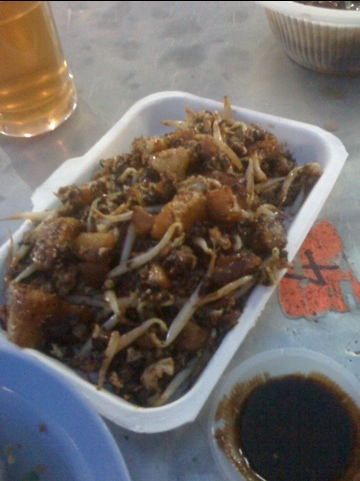 And this char koay teow. 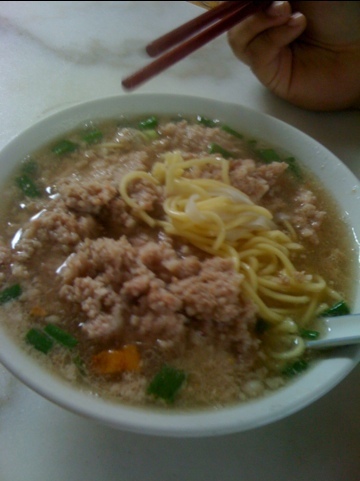 Mr A wasn’t in a shrimpy mood that morning, so he had some of hte soup noodle, involving pork mince and Hokkien noodles. After about 20 minutes, the har mee finally came, and let me tell you, this was the most intensely shrimpy broth I’ve ever tasted. Well, that might not quite be true, because there are a few Vietnamese dishes which would give it a run for its money, but what set the har mee apart is that its flavour had a lot more to do with prawn heads and shells – like a bisque – than the use of fermented prawn paste. I would have finished all of the broth, except it was making me thirsty. That’s not to say it was laden with MSG, it was just very salty and rich. I was left to my own devices for lunch, because Mr A was busy, and to be honest, I was hitting the food fatigue wall. I often laugh at those who claim that certain foods aren’t ‘breakfast foods’, but seriously, prawn fritters, char koay teow and har mee is a hefty challenge. I thought I should try something a little less punchy for lunch, so I headed to nearby Fatty Loh’s, a chicken rice specialist, with a cartoon chicken mascot. Never trust an animal that is selling you its own flesh. The chicken itself wasn’t great. It was a bit on the dry side, though quite tasty. The pork was much better, though the highlight was actually the chicken rice. Well seasoned and lightly garlicky, I would have been happy to eat it on its own. The sambal was also quite good, though not really sour enough, and well, the less said about the vegetables the better. Oil city. 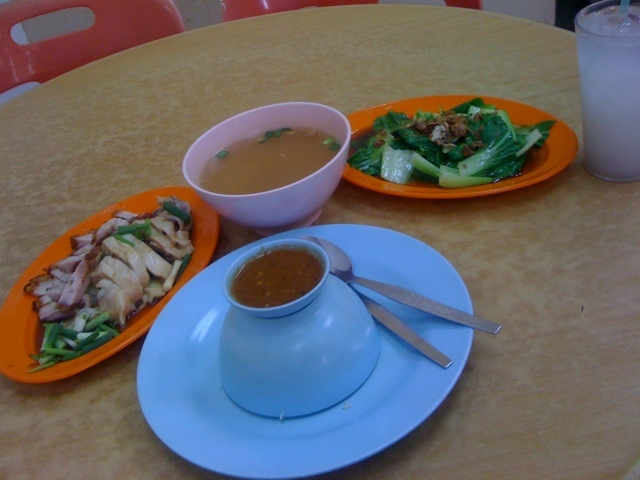 Full, but unsatisfied, I craved more chicken rice. When Mr A picked me up for dinner and asked what dishes I’d still like to try, I told him without hesitation that I was yet to try good chicken rice here in Penang. He seemed a little surprised – chicken rice is not enough of a Penang specialty, perhaps – but he quickly knew exactly where to take me. As we walked up to the little hawker ‘restoran’, proudly out the front was its big draw: the chicken rice stand. I’m fairly sure Mr A ordered me what was a double serve, as I did see other locals having chicken rice, but their servings weren’t nearly as generous as the one placed in front of me. Feeling a tad guilty, I nonetheless tucked in. Oh, the joy of simple, perfectly boiled chicken. The meat was tender, moist and succulent. The texture was not so far removed from the soft, plump skin which clung to it. Yet somehow, while being oily, it didn’t taste greasy at all. The polar opposite of Fatty Loh’s, the rice here was just plain steamed white rice. But I didn’t care; that chicken… that chicken! The sambal was also very good. Nice and piquant, though I could have done with a little more chilli heat. As if that weren’t enough eating, because it was my last night in Penang, Mrs A insisted that I should try everything I hadn’t yet tried, pressing me to name dishes I still hadn’t sampled on my short eating tour. 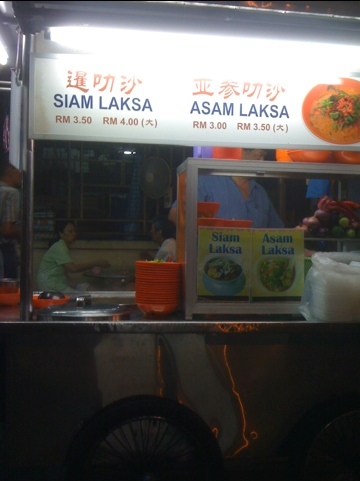 The only thing that came to mind was Siam laksa. So we stopped off at another local neighbourhood night market. It was starting to rain, and people huddled around tables under tarps and beach umbrellas that sprung up as the downpour got heavier. When I had questioned her about Siam laksa earlier, and how it differed to the Assam laksa more commonly found in Georgetown, she said it was Thai style, and had coconut milk in it. I took this to mean that it was the more common curry laksa style that I was used to in Melbourne. But I was wrong! It was still very similar to Assam laksa – the use of mackerel (or sardine) was still there, as was the trademark tamarind. But this had been married with curry and coconut flavours, creating a whole other experience. Of course, no meal is complete without one last char koay teow. This one was decent, but nothing to write home about. So finally that was the end of the #fatty adventure for me in Penang. I hope you’ve enjoyed reading about and looking at the wonderful food I tried there as much as i did shoving it in my mouth! Next time, we’re back onto more local eateries. Aw man, I love Penang so much. I had crispy oyster omelet in Hong Ngek in KL which was divine, they were supposed to be a Hokkien restaurant too, but who knows – family recipes and all. Liking the fresh new look too, congrats on the change (I still haven’t been brave enough to do it yet…)! hooray! finally Billy… you made it wordpress . love the new look but actually prefer the look of all the food! 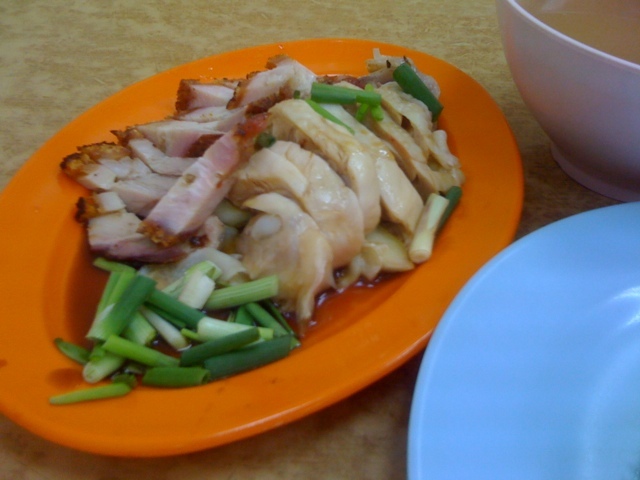 Penang… home of all nyonya goodness and more. omg! I am so craving the Penang food now! I am from Malaysia and must say that Penang foods are the best in M’sia. Just for your information, the penang hokkien noddles are different from the KL penang noodles. Even for the prawn noodle or Har mee. They have the same name but it’s 2 different dishes. 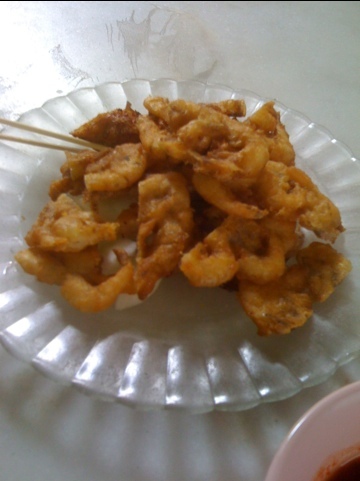 and oh, the pancake that you had at the wet market, it’s called ‘Apam balik’ or ‘ban chien kueh’ and it’s peanut pancake. There are another version of this pancake which has very thin layer and have corns. sorry for the long message but couldn’t resist to tell you more about the penang food!! I WANT! I Want it alll and I want it all now.. hungry! Look at the crispy lobak sides.. yummmmm.. and the Asam Laksa.. I WANT!!! Is there somehwere in Melbourne that does good lo bak? You ate all that in two days… wow. I think kudos are in order.